This easy Strawberry Cheesecake Shortcake Parfait will become your go-to dessert in your recipe box. Strawberry shortcake has always been my all time favorite dessert. Partially because it’s SO easy to make, and partially because it’s just oh so good! It’s the quintessential strawberry dessert and it just screams summer. I’m happy to eat strawberry shortcake all year long, but of course it’s always best when strawberries are at their best. Complicated desserts can be seriously delicious, but sometimes you just need something easy and satisfying. Strawberry Shortcake fits that bill to the T. (ever wonder where the phrase “to a t” came from?) You can choose the easy route and use the boxed Bisquick mix shortcake and canned whipped cream, or use your favorite recipe for either or both. You choose, but either way, it’s easy to put together and oh so easy to enjoy! 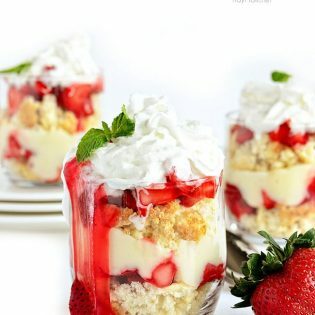 As I was washing the strawberries, Allison came up with the idea that we should add a layer of cheesecake pudding to these tasty little strawberry shortcake parfaits. She dug thru the pantry and as luck would have it…….we had a box of instant cheesecake pudding! I’m sure we are not the first people to add a layer of pudding to strawberry shortcake, but let me just say, it took my favorite dessert to a whole new level with a creamy smooth cheesecake layer! The Marzetti® Glaze for Strawberries was perfect! It made the strawberries sweet with out being runny. If you want to make this dessert completely no-bake – simply use store bought pound cake, angel food cake, whatever sounds good to you. If you’d like to make your Strawberry Cheesecake Shortcake Parfait a little on the lighter side, you could use Marzetti® Sugar Free Strawberry Glaze, sugar-free instant pudding and low fat whip cream. The cups we used were 8 ounces each, and were the perfect size. You can overfill them a little and still keep the portion reasonable. This easy Strawberry Cheesecake Shortcake Parfait comes together in no time and will become your go-to dessert in your recipe box. Beat pudding mix and milk in medium bowl with wire whisk for 2 minutes. Set in refrigerator until ready to use. Heat oven to 4250 degrees F. Clean, hull and cut strawberries into bite size pieces. Mix strawberry glaze and strawberries together in a bowl and set aside. In medium bowl, stir baking mix, 1/2 cup milk, sugar and the butter until soft dough forms. Drop dough by 6 spoonfuls onto ungreased baking sheet (I like to use my stone). Brush the tops of the shortcakes with milk or cream (this helps brown the tops). Bake 10 to 12 minutes or until golden brown. 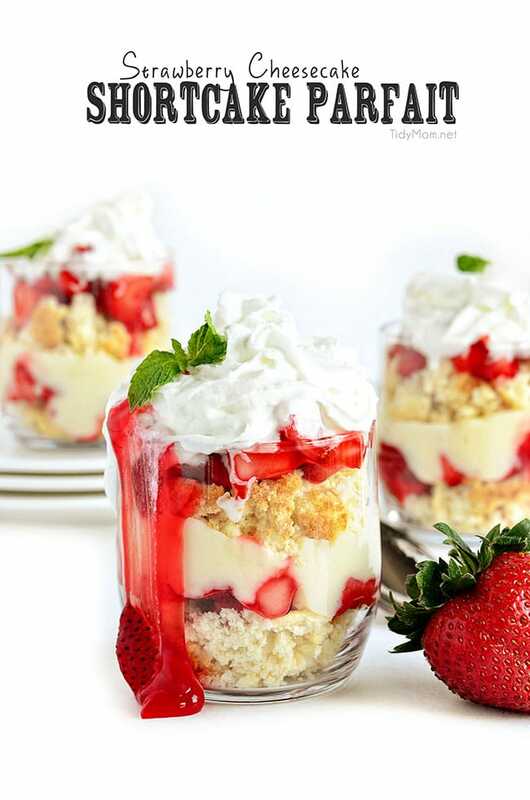 To Assemble (when ready to serve): Layer each cup with crumbles shortcake, glazed strawberries, cheesecake pudding, more crumbled shortcake, glazed strawberries and top with whip cream and a fresh mint leaf. Disclaimer: I have a working relationship with Marzetti® as part of their ambassador program. As always, all views and opinions are my own. 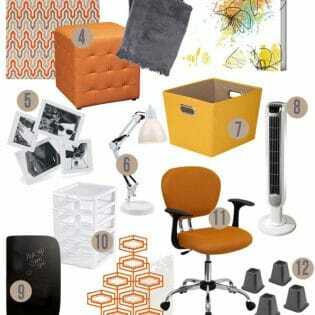 Fun & Essential Items for Dorm Room | $150 Wayfair Giveaway! Well, it doesn’t get any better than this. Yum! LOVE the cheesecake layer. That’s pure brilliance! I am swooning over that glaze.. nommm!! I love the little parfait building graphic!!! too cute! I love Strawberry shortcake and my sister in law does too!! Love the idea of pudding!! The cheesecake layer – genius! I could eat this parfait every day! Pinned! Gorgeous dessert. 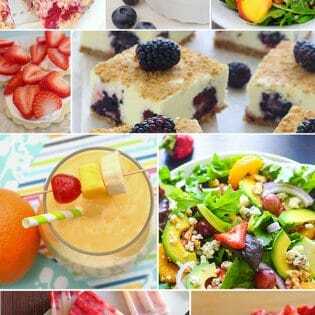 I love a layered dessert full of fruit. What a great idea to add a layer of cheesecake pudding! This is one delicious looking parfait! This looks totally amazing! Yummyyy! The animated gif is so fun! So gorgeous! Almost too pretty to eat but I think I could do it. Yumm..This looks so elegant. I’m sure it’s delicious, too! These are gorgeous and oh so easy to make! I love layered desserts. This parfait is so pretty! This easy-making dessert looks so delicious. Oh no, my mouth is watering! I am considering eating my computer monitor now. The animated photo is as wonderful as the desert. Please, keep making fantastic food! Cheryl, these are absolutely gorgeous!!! Colorful and perfect for summer!! I love the pics & the gif too! And of course the recipe!! I’ve never seen anyone turn a strawberry shortcake into a parfait before – what a brilliant idea! Oh yes! Yes! Yes! Sounds delish. My mother has already made it is delicious. It is a easy desert to make she says.